3 years & up. 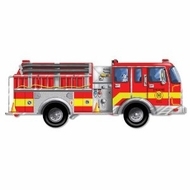 The big bright and boldly detailed fire truck is sure to provide hours of fun. 24 jumbo pieces will help develop motor skills and problem solving abilities. 4' long.